When it comes to helping animals impacted by the tornados however, no national organization is donating financial support or other needed supplies on a grand and prioritized scale. If you want to help support the animals displaced or injured by the series of tornados that have ravaged Oklahoma, it’s always best, as well as more efficient, to give directly to local organizations. This was true after the explosion that ripped apart the small town of West, Texas, and after other natural and manmade disasters – local organizations can put donations (money or supplies) to better use and with less bureaucratic red tape if given directly than if filtered through some other large organization. For a great list of local organizations worthy of support, check out this article by vetstreet.com – it includes groups that require monetary donations, as well as food and supplies, and those that are taking in displaced pets in hope of reuniting them with their owners. 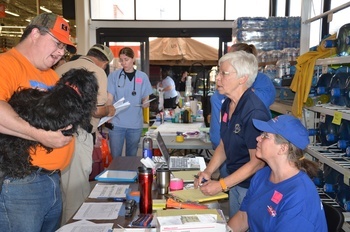 IMAGE: The U.S. Department of Agriculture’s Animal and Plant Health Inspection Service personnel, Oklahoma Department of Agriculture, Food and Forestry staff, and volunteers work at the pet triage at Home Depot to care for and relocate lost pets in Oklahoma. Photo courtesy of the ODAFF via USDA.gov.